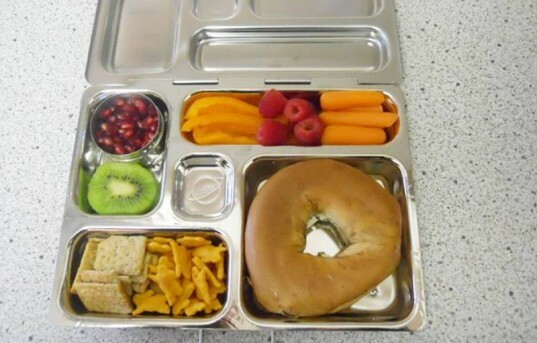 Bento box style lunches for kids have been growing in popularity, and some moms rave about how they can make packing an organized, healthy lunch that’s also fun to eat, a whole lot easier. So when my son Cedar and I recently got the chance to review the PlanetBox Complete set we were eager to give it a try. The set includes the PlanetBox, a safe, food grade quality stainless steel meal container; a stainless steel big dipper container, a stainless steel little dipper container. an insulated Oeko-Tex standard carrying bag made with 100% recycled material, and a set of fun magnets made not with PVC/vinyl, but a more eco-friendly rubber material. We’ve been testing the PlanetBox set out for a couple of weeks now. Keep reading to find out what Cedar and I think of the set. Cedar was thrilled with this lunch kit when he saw it, noting, “Wow, it’s like my own laptop!” He also thought the magnets were a fun idea. And, I heard it got a design thumbs up from friends at school too. So far there has been zero issues with Cedar excitedly opening his lunch and having it spill (my main worry). When he came home after four days of use, even before I could speak, he said, “NO, I didn’t spill my lunch today!” Thus, I quit asking. PlanetBox products are free from lead, vinyl/PVC, phthalates, bisphenol-A (BPA) and other harmful or toxic substances. PlanetBox is made to last and appears very sturdy so far, as does the carrying bag. At the end of PlanetBox’s life you can hand it over to your local recycling program or send it back to the company, which will recycle it for you. The PlanetBox along with the bag holds a ton of food. My son is nine, very active and always, “Starved to death.” His normal pattern is to munch a morning snack, lunch at some point, then have a later snack. I was able to pack him enough food for lunch plus two small snacks using both the PlanetBox and carrying bag. The bag has two handy pockets so you can stick a banana or granola bar in. I estimate that after the age of ten you may need a bigger lunch box though. Food never ever merged from one compartment to the next. The PlanetBox works very well at keeping dry food items in the container you originally place it in. You should place wet items in a container though. You don’t have to hunt down a million lids for lunchtime containers in the morning! You just fill up the tray and go. That’s a huge time saver. 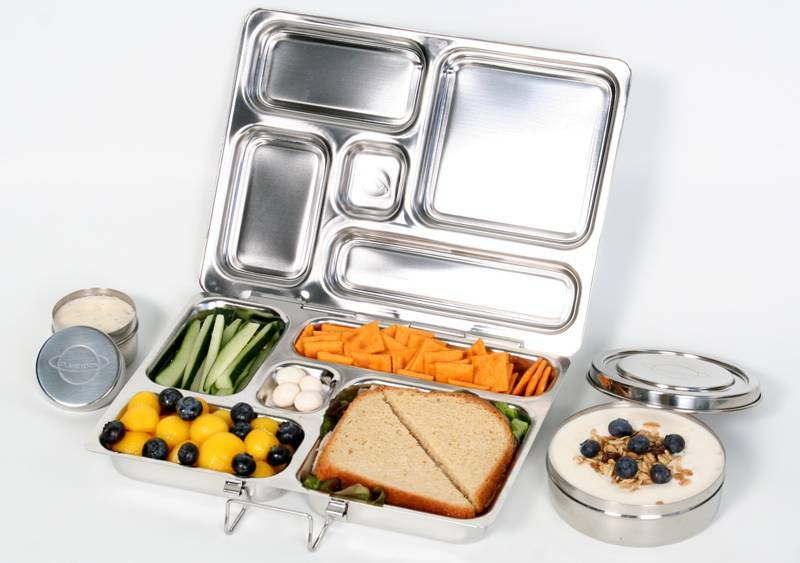 The main food compartment in PlanetBox is too small for the average whole sandwich. As you can see in the picture above, it fits a normal bagel just about perfectly. Bread though, is usually bigger than a bagel. A whole sandwich made with average-sized bought or homemade wheat bread doesn’t fit into this compartment unless you cut the crust and a bit of bread off. Cedar likes the crusts and I hate wasting food, so this was a bummer. My store sells just two kinds of organic yogurt in bulk, and even then they often run out. So, sometimes we buy organic yogurt in single serve containers. Single serve yogurts don’t fit well anywhere in the carry bag and I had to send an extra little bag to school with an ice pack. Along those lines, there’s not really anywhere to put a whole apple or pear either. PlanetBox and the dipper containers are not made to keep food hot and CANNOT be microwaved. It’s very dangerous to microwave metal. If you like to send hot foods or microwave-ready foods, you’ll need to send an extra, microwave container along. The dipper containers also aren’t made for broth/liquid based soups, so if your little one likes this sort of meal, you’ll need a good thermos. Overall: We give it an enthusiastic thumbs up for kids 10 years old and under. After that you may need something bigger. We suggest the Citizenpip reusable lunch kit for older kids. Get creative packing the PlanetBox with food and dippers. 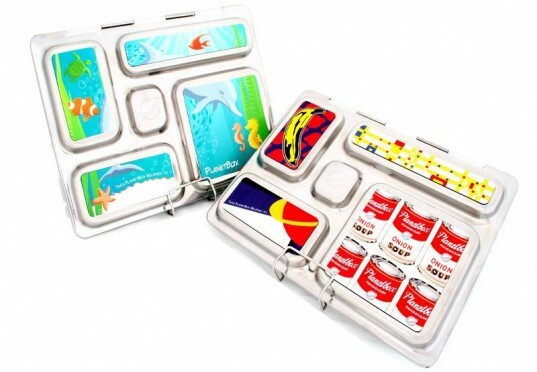 Bento box style lunches for kids have been growing in popularity, and some moms rave about how they can make packing an organized, healthy lunch that's also fun to eat, a whole lot easier. So when my son Cedar and I recently got the chance to review the PlanetBox Complete set we were eager to give it a try. The set includes the PlanetBox, a safe, food grade quality stainless steel meal container; a stainless steel big dipper container, a stainless steel little dipper container. an insulated Oeko-Tex standard carrying bag made with 100% recycled material, and a set of fun magnets made not with PVC/vinyl, but a more eco-friendly rubber material. We've been testing the PlanetBox set out for a couple of weeks now. Keep reading to find out what Cedar and I think of the set. PlanetBox features fun magnets too. Lunch ideas for filling a PlanetBox are endless! PlanetBox has lots of colors to choose from for the bag. The sandwich area only holds smaller items so you may have trouble if you want to pack a larger sammie. The PlanetBox lunch container tucks neatly inside a special lunch bag.